When a Nobel Laureate comes back to campus, people flock. The UCLA Department of Chemistry & Biochemistry presented its annual Norma Stoddart Award ceremony and lectures on Oct. 2, 2017, and Sir J. Fraser Stoddart, who received the 2016 Nobel Prize in Chemistry, was in attendance to tell a standing room only-crowd of students and faculty about the remarkable woman who was his wife. The Stoddarts came to UCLA in 1997. “She was Fraser’s secret weapon,” said Ken Houk, distinguished professor and Saul Winstein chair of organic chemistry. He added that much of Fraser Stoddart’s Nobel-winning research was conducted at UCLA – and, in turn, owed a great deal to Norma. Houk went on to describe Norma as a brilliant biochemist and an important contributor to many papers that came out of UCLA during her time with the university. He praised her skill and flair at science as well as in her interactions with students. The Norma Stoddart Prize for Academic Excellence and Outstanding Citizenship was established by the family in 2004. It is open to all current and recently graduated research students and fellows in the UCLA Department of Chemistry and Biochemistry. Selections are made by a committee of graduate students within the department. 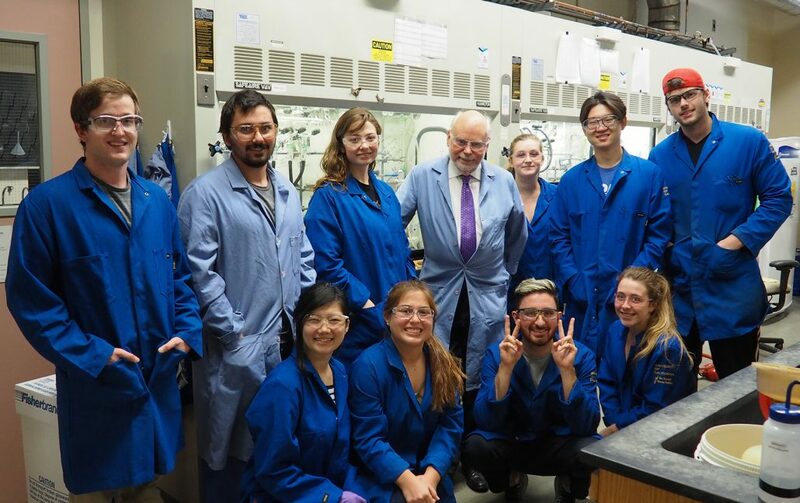 During his return to campus to present the annual Norma Stoddart Prize to winning students in the Department of Chemistry & Biochemistry, Nobel Laureate and professor emeritus Sir J. Fraser Stoddart visited with faculty and students, including the Hosea Nelson group. Photo by Penny Jennings. García-Garibay described how Fraser developed tools of chemistry that were elemental in the development of his own specialty, molecular machines. After these introductions, Stoddart took attendees through the life of his beloved Norma, who succumbed to breast cancer in 2004. Being in the conference room named for Donald Cram, Fraser first recognized the guitar-playing former UCLA professor and fellow Nobel Laureate – one of four who have come out of UCLA’s storied department. He praised Cram for his “extreme support and warmth” when he made his first visit to UCLA in 1978. Fraser then took the audience through a slideshow journey of Norma’s life, from imagery of her parents’ honeymoon to Norma’s birth announcement in the local Scottish newspaper to her schooling, including graduating at the top of the class from the University of Edinburgh with a first-class honors BSc degree. He charmed the audience with details of his first meeting with Norma in 1965; their wedding on Oct. 8, 1968; the arrivals of their daughters, Fiona and Alison; and the variety of places where the family lived based upon where the chemistry research took them. Fraser’s stories about Norma and their life together were told with intimacy, self-effacing wit, and a slice of sarcasm that had the audience chuckling throughout. One poignant story focused on the day that Norma’s Ph.D. thesis on “the Hydroxylation of Cholesterol by Rat Liver” was up against a submission deadline. Dismayed by the mistakes being made by a hired typist, Fraser took the duty upon himself and pounded away at a small Olivetti for hours. As the night progressed, Norma brought a mug of coffee to revive him. “But when I reached the end of the next line and the carriage returned to the other side, it knocked the cup over, spilling coffee all over the stack of pages that I had typed,” Fraser recalled. When she retreated into a corner in tears, Fraser promised Norma he would stay up all night to retype everything, and he did. She received her Ph.D. in 1969. Norma was diagnosed with breast cancer in 1992 when Fraser was a professor of organic chemistry at the University of Birmingham. “It was the beginning of our 12-year battle,” Fraser described. At that time, Houk, then chair of the UCLA Chemistry & Biochemistry department, reached out to Fraser to offer him the new Saul Winstein Professor of Chemistry chair. Given Norma’s health they were unable to relocate, and Fraser presumed the opportunity had passed for good, especially given his frame of reference at the time. “In the UK, when you are offered a faculty position, you have 24 hours to say yes, then it’s gone forever,” he said. Two years later, Fraser traveled to UCLA for a celebration of Donald Cram’s 75th birthday, and was surprised to discover that the Winstein chair was still open. Again, it was offered to him, but Norma was still undergoing treatment, so Fraser turned down the position once again. Finally, in 1997, with Norma well enough recovered – as well as encouraged by the constructive new approaches being offered by breast cancer physicians at UCLA – the family moved to California, and Fraser became the Saul Winstein Professor of Chemistry. The rest, as they say, is history – one that the winners of Norma’s award relish with admiration and gratitude. Liana received her B.S. in chemistry from UC Davis, where she performed undergraduate research under Professor Xi Chen working on chemo-enzymatic synthesis of heparan sulfate oligosaccharides. She obtained her Ph.D. in 2016 from UCLA under the direction of Professor Neil Garg. Liana then joined Professor Scott Miller’s research laboratory at Yale University as an NIH Postdoctoral Fellow, where she works on site-selective modification of complex molecules. Her Norma Stoddard Prize lecture was entitled “Activation of Unconventional Electrophiles for Cross-Coupling Reactions”. 2017 Norma Stoddart Prize winner Christian Beren is currently completing his Ph.D. thesis at UCLA in the Department of Chemistry and Biochemistry, working under the supervision of Professors Bill Gelbart and Chuck Knobler in the field of Physical Virology. Christian investigates how basic physical properties of RNA affect both the assembly and disassembly of single-stranded RNA viruses. In addition to research, Christian has been involved in the CNSI outreach program at UCLA for several years, a program that brings nanoscience experiments to Los Angeles area high schools, and he enjoys teaching and mentoring younger students, both in courses and in the lab. He was also one of a handful of graduate students chosen from across campus in 2016-17 to teach his own course (“What is Nanoscience?”) as an instructor in the Collegium of University Teaching Fellows. His Norma Stoddart Prize lecture was entitled “The Effect of RNA Secondary Structure on Virion Assembly and Genome Release”. Stoddart joined the faculty at Northwestern University as its Board of Trustees Professor of Chemistry in 2008. Since 2011, he has returned to UCLA each year to present the Norma Stoddart Prize. The 2016 and 2017 awards were given out together in order to accommodate his schedule. Stoddart, a self-described “Twitter monster”, documented much of his visit on his feed, @sirfrasersays.